Girls and ponies. It's a romance I remember fondly from my own childhood and one I'm keen to nurture in Elsa. 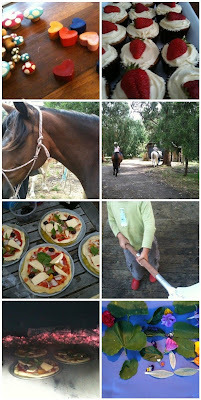 To celebrate her birthday, Elsa asked a couple of friends on a short trail ride at a nearby farm. The horses were gorgeous and the girls loved it. Then it was back home for a feast which included, of course, lots of cupcakes. In other culinary news, the pizza oven had it's first cooking session and oh my, those pizzas were truly the best ever. It was the summer solstice that night and the children were allowed to stay up for as long they liked. We left out flowers and sweets for the fairies and in the morning, we found they had left us a small gift of crystal. It was a magic night with our little family, to savour the quiet before the first of the family arrived the next day. PS I had to take these photos on my phone, not the best quality, but my digital slr has died. Sob. Hope Santa brings a new slr- but the phone camera seems to work pretty well! Hope you have a wonderful Christmas with family! What a lovely thing to do! I'm reminded of books I used to love to read as a girl. I've just found your blog- lovely!